The Dubliner knew his chances of a pick were slimmer than slim three weeks ago, when fiery Spaniard José María Olazábal said at US PGA that he needed to do something “extraordinary” to get one of his two wildcards. Sunday night’s phone call from Olazábal has just made Harrington more determined to return to the fold and he’s certain he has the game to win his seventh cap under Paul McGinley or Darren Clarke in Gleneagles in two years’ time. Already planning his Ryder Cup return, Harrington said: “It’s nearly a given that we’ll have an Irish captain the next time as well. Which one? That’s the question. “I’d be rooting for Paul and thinking that Darren will get it after that. Will they give it to two Irish guys in a row? We’ll see, but they will definitely give it to Darren at some stage. Harrington was disappointed but not surprised to miss out on a wildcard, explaining: “The dogs in the street knew I wasn’t getting a pick so it wasn’t a hard phone call whatsoever. “It was a polite phone call from José. I knew the result. Obviously it wasn’t news to me. I was quite comfortable with his two picks. I think they’ll do very well. “I wish the team well and I wish the players well. I’ll certainly be watching it and rooting for them when it comes round. Pádraig Harrington laughs during a press conference at Royal Lytham and St Annes in July. Picture Fran Caffrey www.golffile.ieHarrington revealed that his 2003 spat with Olazabal was never mentioned when they spoke on the phone on Sunday night. And while he was disappointed not to win his seventh cap, he was not disappointed by the call. He knew it was coming, after all. His real disappointment came during the US PGA when he learned how Olazábal had all but dismissed him as a viable wildcard candidate. “I was disappointed two or three weeks ago when it came out that I wasn’t in the running,” he said as he drove in lashing rain on I-95 to this week’s FedEx Cup stop in Boston, the Deutsche Bank Championship. “It was much harder two years ago with Monty when there were three of us for four places and nobody was quite sure how it was going to go down on the Sunday. This time round it was very clear. “I was only aware of [what Olazabal said at Kiawah] it to the extent that I was asked about it a couple of days afterwards. I wouldn’t have been aware of what he was saying at the time. “You know, this is why you have automatic places to make it. You have to qualify automatically and that’s the way it is. Falling out of the world’s top 50 last June for the first time since March 2000 signalled the beginning of Harrington’s Ryder Cup headaches. Instead of clawing his way back, he fell as far as 96th on the eve of the Masters, where he came eighth. He missed a host of events that offered easy world ranking points - the HSBC Champions, the Tour Championship, the Dubai World Championship, Chevron or Sun City, the WGC Accenture Match Play and the WGC Cadillac at Doral. Pádraig Harrington prepares to tee off in the final round of the US PGA at Kiawah Island. Photo Eoin Clarke/www.golffile.ie“I knew I needed a big year because I wasn’t in events like the world golf championships and others which offer relatively easy ranking points,” he said. “If you’re not in those events, you have to have some big performances to make it into the team. I didn’t have those big performances so I don’t have an issue. Preparing for a Ryder Cup TV marathon instead, he said: “I will watch it, absolutely. I will probably sit down and watch 10 hours a day. It will be strange not to be there but that is the way it goes. “I wish the team well and I wish the players well. I’ll certainly be watching it and rooting for them when it comes round. I think he’s made two really solid picks. Harrington knew he needed to win the US PGA to have any chance of qualifying for the team by right. 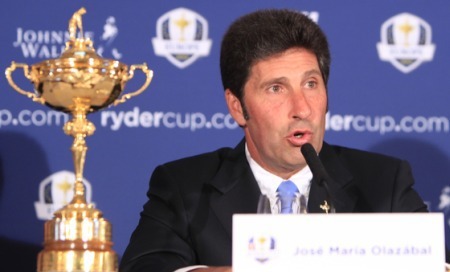 But once Olazabal made it clear at the US PGA that he needed to do something special, he was aware he had to change the Spaniard’s thinking with a big performance. “You know, there’s no doubt, when I was in with a good chance of a big finish at the PGA and again leading out at Barclays, you are wondering if this will change things. It was a question of changing things. “When I went into the Barclays in 2010, I was trying to hold onto things. You wanted to have a big week but you also didn’t want to have a bad week. At the PGA it would have been very easy to finish second – obviously last week, I played great all week. “It would have taken a lot to win the tournament last week. It was a nice golf course in the morning and as tough as you could get in the afternoon. I’d love to have seen a stroke average for morning rounds and afternoon rounds last week. There must have been three or four shots in the difference. “Last week there wasn’t a distraction as I wasn’t trying to hang onto a position and not play myself out of the team. I was just trying to play well. 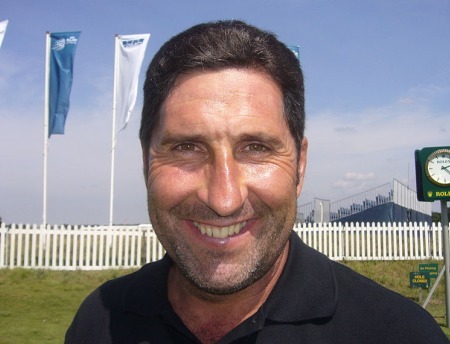 Olazabal referred several times recently to Harrington’s lack of form with the putter over the past year or more. And while the Dubliner admits that his game is better than ever from tee to green, he knows he has lost some of his mojo on the greens. When I suggested to him after the Irish Open - tongue in cheek - that he was morphing in Colin Montgomerie in the sense that he was hitting so many more greens and therefore missing more putts than ever, he disagreed. Monty was a one-off, he said. But when speaking to Dublin-based Newstalk radio later on Monday evening, he came closer to agreeing that his game is less spectacular but more reliable. “I feel like I’ve played great because things that were weak in my game are now exceptionally strong,” he told Off The Ball. “I will be the first to admit that things that were the best part of my game are not as good. I haven’t putted as well this year as I would have putted when I was winning. The strongest part of my game hasn’t been so good this year, but it looks really good for me. “The game is so much simpler for me. It’s been so much easier. I play with so much less stress. I actually have to get used to playing the way I am playing, it is so different. “But I do need to putt a little bit better and I have to come to terms with that. I tend to have a lot more birdie putts from the mid-range. Inevitably, the chances of holing are less and it looks like you are putting badly. “I am not having to chip and putt and recover from the trees, but when you do that you feel good about your game and it can build momentum. At the moment I am playing really solid and sometimes, solid isn’t what you want. Qualifying for the 2014 Ryder Cup begins next September and Harrington’s goal is now to get himself back into the higher echelons of the world rankings as soon as possible. He said: “I talked to a journalist earlier and said it only makes me keener now to qualify for 2014 and my qualification for 2014 starts now. I know I have got to get myself into position for when it starts in September 2013. Garcia on Harrington wildcard: "He wouldn't be a sure pick for me!" Sergio Garcia walking off the 17th green after winning the 2008 Players Championship. Picture: Craig NealPádraig Harrington has history with the Spanish Armada and it appears it could come back to sink his Ryder Cup wildcard hopes this week. Ryder Cup team mates Padraig Harrington and Jose Maria Olazábal will remain ‘amigos’ despite Sunday’s Seve Trophy bust up. Olazábal on Pádraig's non-pick: "I think he took it well"
Pádraig Harrington probably wasn’t smiling when he took José María Olazábal’s call on Sunday.Padraig Harrington simply didn’t play well enough over the past 12 months to warrant a wildcard from European Ryder Cup skipper José María Olazabal.